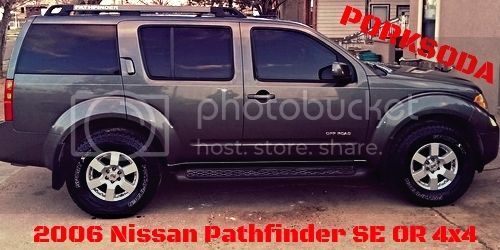 I am considering an 08 Pathfinder SE 4x4 v6 with 94k miles and would like some input. I am aware of the trans/radiator issues, and have searched the vin on nissans site for open recalls/campaigns. It showed nothing, but I'm not sure what that means. How do I confirm it has been taken care of? If not, what will need done? I am also looking at a Toyota Sequoia, and having a hard time deciding between the 2. Radiators prone to failure usually have the part numbers 21460-EA200, 21460-EA215 or 21460-EA265, which are the original radiator part numbers. The part # is located on a Calsonic sticker on the top tank of the radiator. If it's a different number, like 21460-9CA2E, it has likely been replaced or if there is no sticker or a non-Calsonic sticker on the top tank, it is likely an aftermarket replacement, which is fine. If you have an original radiator, you can either replace it or bypass the internal trans cooler of the radiator. Bypassing will remove the flow of trans fluid through the radiator cooler, passing only through the auxiliary trans cooler (which comes on all North American R51 Pathfinders from the factory). This method takes away the warming abilities of the radiator's cooler and in extreme cases, could sacrifice some cooling ability. Replacing the radiator retains the function of the radiator's integral cooler and aftermarket radiators, as well as the updated Nissan radiators, have not been prone to the cooler failures. Options for radiators are wide spread. The genuine Nissan replacement is close to $450. The Nissan "Key Value" radiator and CSF all-aluminum radiators are $350. Spectra-Premium is one of the more popular, aftermarket choices and goes for $110+shipping at Rockauto.com. Ebay has new, aftermarket radiators for as low as $50. Most of the aftermarket radiators, including Canadian brand, Spectra-Premium are made in China, but the quality of those units has been pretty good. Other issues common on 2008 Pathfinders include faulty fuel sending units and some have upper timing chains that may start to whine and require replacement. The Sequoia is a very different animal than the R51 Pathfinder. It is much larger and similar year will be more expensive. It is heavier and has greater towing capacity and the interior is cavernous compared to the Pathfinder. It has two engine options, but they are both V8's, the 4.7L and the 5.7L. The Armada would be a better match to the Sequoia for comparison purposes. The Pathfinder should be compared to the 4Runner. You should compare the Armada and a Sequoia. Those are much more comparable. Like he said above a better comparison to the pathfinder is the 4runner. I am aware the Sequoia is larger, along with the Armada, but I am having trouble finding any in my area. I found the Pathfinder close by, so it's more a matter of locating one with low miles. I think I would prefer the Sequoia not only for its size, but also Toyota reliability?? The Sequoias I'm looking at are 2005-2006. I would consider an Armada as well, but not many around where I live. Do the Armadas have the same radiator issue? No the Armada's did not have the issue because they v8's which use a different radiator. V6 and V8 Pathfinders used the same radiator, but the Armada and Titan use a different radiator than the Pathfinder. The Titan/Armada radiator has issues with the lower tank cracking and leaking. Thank you for these tips and a very happy new year to you. This will allow me to repair my car. If you have an original radiator, you can either replace it or bypass the internal trans cooler of the radiator [url=]consultant SEO Paris[/url]. Bypassing will remove the flow of trans fluid through the radiator cooler, passing only through the auxiliary trans cooler (which comes on all North American R51 Pathfinders from the factory). This method takes away the warming abilities of the radiator's cooler and in extreme cases, could sacrifice some cooling ability. Replacing the radiator retains the function of the radiator's integral cooler and aftermarket radiators, as well as the updated Nissan radiators, have not been prone to the cooler failures. Howdy! It seems you inserted something on his post.